The Leeds Triathlon took place on Sunday 11th September 2016, at the city’s iconic Roundhay Park and was blessed with clear skies and sunshine. Hundreds of competitors and supporters made their way to the stunning green parklands that host this annual sporting event, a key fixture in the UK triathlon calendar. Once again the Leeds Triathlon proved to be a day of fantastic sporting achievement and huge crowd support. The action started with the first wave at 8am at Waterloo Lake, where friends and families were already gathered to cheer on competitors whilst enjoying a day out. The standard distance race incorporated a 1.5km open water swim in Waterloo Lake, a fast and scenic 44km cycle leg and a 9.4km run in the beautiful setting of Roundhay Park. Athletes in the sprint distance race completed a 750m swim a 24km cycle and a 6.4km run. The Leeds Triathlon was also a GoTRI+ event for beginner triathletes, offering all the enjoyment of the triathlon but over shorter distances: 400m swim, 11.5km cycle and 3.35km run. GoTRI+ waves included GO TRI Open, GO TRI This Girl Can, GO TRI Platinum 50+, GO TRI Splash and Dash (swim/run only) and GO TRI Pedal and Plod (run/bike/run only). Athletes were able to enjoy support during all stages of the event thanks to many viewing points along the course, including along the drive in front of the mansion for the grand downhill finish. In the standard race Charles Hickman took the winning title. Coming out of the water in 8th position he secured the win with a two minute gap in 02:09:39 after a fast cycle and run, ahead of Richard Howart and last year’s winner, Peter Shuttleworth. Louise Kelly was the fastest in the women’s field after taking the lead on the bike leg and Kelly crossed the finish line in 02:23:28. Runner up Caroline Higgins finished in 02:30:45 and Emma Will took third place in 02:31:05. The sprint race saw Andrew Turner take the win in a time of 01:21:26, ahead of Ciaran Forde who finished in 01:22:13 and Stephen Coy in 01:22:45. Hannah Pinkney claimed the women’s title in 01:28:15, with Becky Penty coming second in 01:36:44 and Anna Hobbs securing third place in 01:38:47. Race Director Simon Hill commented: “The Leeds Triathlon has been another successful event for Xtra Mile Events, and we would like to thank all the athletes and spectators who turned out in their hundreds to make it such a memorable day. We were delighted with the feedback from all present who praised the smooth organisation, magnificent setting and excellent course. Swimming in the same lake as the Pros who competed in the ITU World Triathlon event in June this year added some extra excitement and proves what a world-class venue Roundhay Park is. Bone Cancer Research Trust was the official charity partner for the 2016 Leeds Triathlon. Sponsors of the Leeds Triathlon included Zone 3, Race Force, Clif Bar and TrueStart Coffee. 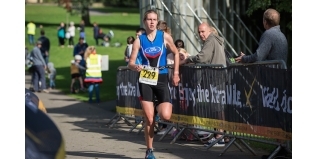 The next event on the Xtra Mile Events calendar is the South Manchester Triathlon this Sunday 18th September, entries to which will close on Wednesday. Go to www.xtramileevents.com for further details about Xtra Mile Events and to register for all events. You can also like the Facebook page www.facebook.com/TriathlonUK and follow Xtra Mile Events on Twitter @GreatTriathlons and Instagram xtra_mile_events.